This summer SY Isabell sailed across the Baltic Sea, first to the Swedish island of Gotland, and then across to Latvia and Estonia. We sailed all the way around the Gulf of Riga, visiting small fishing villages as well as the city of Riga. A lot of useful information we got from the english Cruising Association guide, written by Faye and Graham Cattell, titled: HARBOURS OF THE BALTIC STATES, 7th ed. 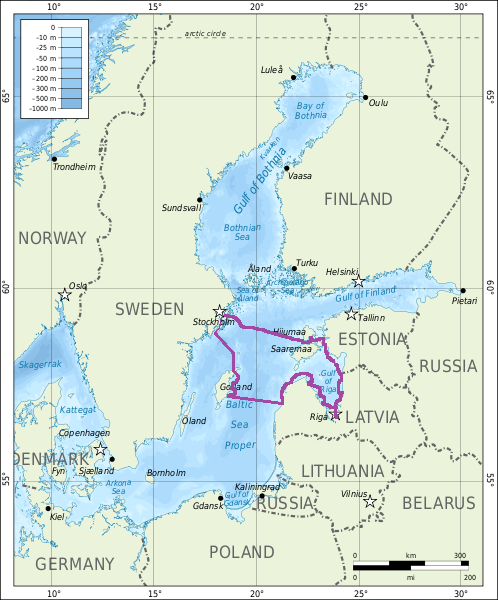 as well as information provide about the Baltic states by the Swedish Cruising Association and the Baltic Sea Cruising Network. Follow us in the table below. Bullandö Marina (18 June) 59°17.9′N 018°39.0′E 0 (0) We start off from the homeport at 1015 AM. Weather is rainy with a southeasterly breeze. Arrive at Lauterhorn (21 June) 9.15 AM 57°58′N 019°05′E 94 (120) First users of the newly installed septic tank evaporator system in the harbour! Herrvik (22-23 June) 57°25′N 018°55′E 58 (178) We stay for two nights. It is rainy. We go sightseeing and buy fish at Katthammarsvik. Ljugarn (24-25 June) 57°19′N 018°42.5′E 18 (196) Visiting daughter Ronja at her summer job on Gotland. Stay for two nights. Drive to Visby to buy spare parts, food, and a new battery charger. Baltic Sea crossing 26 June – 27 June 20 hours non-stop with wind vane steering during most of the trip. Crossing the DW strip of 12 nautical miles without any problems. A beautiful sunset. Pävilosta, Latvia (27 June) 4 AM 57°53′N 021°10′E 92 (288) We checked in with the harbour master at 4 AM. The man spoke great French. I guess he mistakenly took our Dutch flag for the French one. In the morning the Customs officers came aboard to check our paperwork. No problems! We walked the beaches and then went to a park to see folk-dance contest. Warm and sunny. Ventspils (28 June), Latvia 57°23′N 021°32′E 38 (326) We go out for dinner in the town, ut it is Sunday and everything is closed, except the take-out Chinese restaurant. So we eat out at the river near the castle. Roja, Gulf of Riga (29-30 June) 57°30′N 022°48′E 72 (398) Friendliest harbour master and quiet little harbour. Turned into a wall-to-wall boat carpet when the boats came in that participated in the annual Baltic Open Regatta. Party party! Engure (1 July), Latvia 57°09′N 023°13′E 32 (430) Free of charge harbour, very bad pontoon jetty without service. Little, and not very exciting town. Riga, Andrejosta harbour (2-4 July) 56°57′N 024°05′E 36 (466) Riga is a big city with highly contrasting scenery. Weather was fantastic, and we stayed long enough to learn to find our way around town. Lots of sightseeing, great beer and good food. Nice harbour with decent service. Skylte (5 July), Latvia 57°19′N 024°24′E 34 (500) Walked through the sandy dunes and along the sandy beach. Monument for the people lost in the second world war and during the Soviet era. 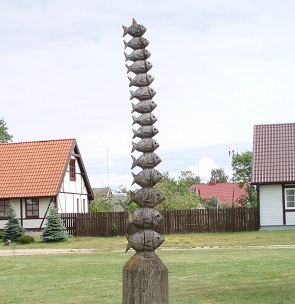 Salacgriva (6-7 July), Latvia 57°45′N 024°21′E 31 (531) Nice town with a beautiful scenery along the Salac river. Here we discovered the fishing bridge across the river. From the bridge, which is torn down by the ice flows every winter/spring, the locals fish for neon eyes (a freshwater fish). We had to ty down to double bouys and with several lines to the pontoon in the harbour, since the Force 7 wind was right into the river mounth, shaking our rigging for two days. Island Kihnu (8-9 July), Estonia 58°08′N 024°01′E 30 (561) Beautiful island. Great for wandering about on the gravel roads through fields and forest. We walked to the southern lighthouse, where the locals sold handcraft and food. We had the company of a stray dog across the island. We left the dog at the lighthouse. Ate local food in the restaurant in the centre of the island and bought food at the local store (very small). Nice harbour with a long traffic lane in and out. Very shallow waters around the island. No customs control. Orjaku, Island Hiiumaa (11-12 July), Estonia 58°47′N 022°46′E 39 (641) We rented bicycles and biked across the island to the capital city of Kärdla. Shopping for food and ate at a restaurant along the way. 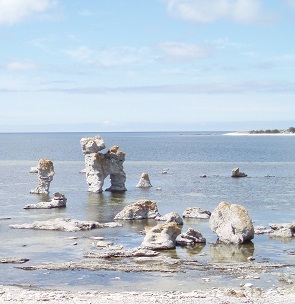 Söru sadam, Island Hiiumaa (14 July) 58°41′N 022°31′E 15 (656) Last harbour in Estonia. Water, food and fixing things to get ready for the leg across to Sweden. Our vacation time is running out. Some other Swedish boats are also waiting to sail home. A young harbour master (maybe 12 years old) is helping us find our way. The boy speaks good english. Sailing home to Stockholm (15-16 July) 140 (796) Leaving Söru at 11.15 local time and arrive in the Stockholm archipelago north of Sandhamn (Björköfjärden) in the evening the next day, at about 20.30 swedish time (-1 hour). Back in the Bullandömarina at 1400 hours on Friday the 17 July. Bullandö marina (home, 17 July) 59°17.9′N 018°39.0′E 17 (813) Home again after this exciting trip. Everything has gone well. Many great memories to cherish.